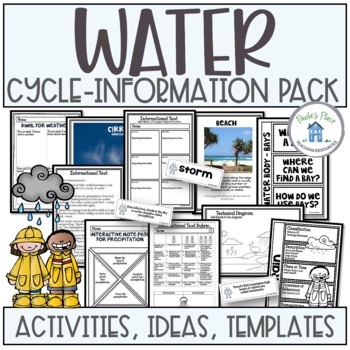 This Rain and Water Cycle Pack is aimed at Grades 2-5. As your students explore clouds, water cycles and properties of Water they will come to an understanding that we cannot live without water. This will assist in assessing what your grade knows and will help when writing the Information Text. This is our new learning about …. Color and black/white versions provided. Spare tags for extra words. Display these words and discuss what they mean. These cards can be used as discussion starters. Display these facts and discuss what they mean. These photos are to be used to assist in writing and exploring cloud types and how water makes it back to our earth as precipitation. Print off and display around the room. 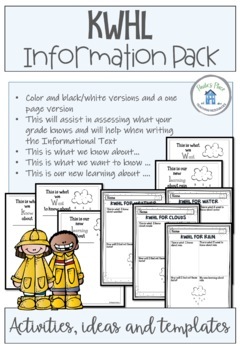 Two INB pages to record information for cloud types and precipitation. This section contains photos taken by me. There are Interactive Notebook pages for each body of water. Have your grade in teams/groups. Each group can use the poster as a start and then do further research to complete the task together. Then present to the grade for feedback. This text is to be used to paraphrase, record the main ideas and add supporting information. Read and interpret a labelled diagram. Use the photos provided earlier in the pack to assist in writing the text. Print off and display around the finished Information Text. 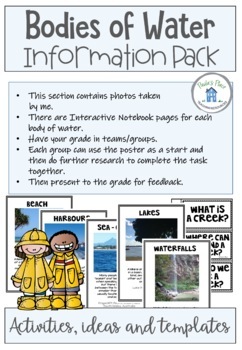 Choose a topic – water, rain, clouds or weather. The rubrics are helpful in assessing the text. 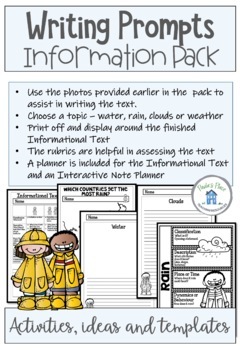 A planner is included for the Information Text and a map Interactive Note Planner.